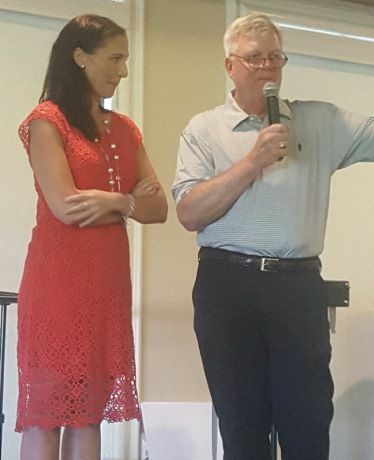 Rainbows For All Children, an organization dedicated to supporting all youth as they navigate and heal from loss, hosted its 28th annual golf classic at the Royal Melbourne Country Club in Long Grove, Illinois, on Monday, June 20. The annual golf classic is the organization's largest fundraising event of the year and draws support from all over the Chicago area. This year's event honored Breck Hanson, vice chairman and market president of Associated Bank, who for 25 years has served as the Rainbows Golf Classic Event Chair and made significant contributions to Rainbows' mission of helping grieving children. Over the course of Hanson’s tenure, the organization has raised more than $5 million, with more than $165,000 raised at this year’s event. Rainbows, headquartered in Evanston, Illinois, has been assisting youth all around the country since 1983. It was founded by Suzy Yehl Marta, a divorced mother of three boys. Marta saw how her divorce affected her sons and wanted to find a support group to help them. With no group existing at the time, Marta began developing a curriculum to help children who experienced a loss, whether from death, divorce, deployment or other trauma. Today, Rainbows’ support groups exist across the United States, serving thousands of children who are grieving the loss of a loved one.